Birch Bark Moose Calls • Increase your Success Rate! Available Now! In my opinion birch bark moose calls are simply the best call to use. Although they are simply a megaphone, they work... and that's all that matters! In order to use a Birch Bark Call, you must use your own voice to recreate the sounds of a moose to attract them. The sounds are simple enough to mimic once you hear them and put in a little practice. I like to listen to recorded calls on my way to camp, it is a great way to get pumped about the upcoming hunt as well as refreshing your memory to what moose sounds are like. Practice mimicking these sounds. That way when you use your birch bark call to call moose, you will have it figured out in advance. Personally I use birch bark moose calls exclusively to call bull moose in close. Over the many years I have hunted moose I have called in a large number of bulls. With each passing year, I learn a little more about the sounds a moose make and I try to commit those sounds to memory so I can recreate them when I call. There does not seem to be a wrong way to call moose, so I encourage you to get out into moose country during the rut and give it a try. 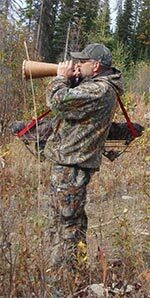 During one season I was successful in calling in five separate bull moose for my partners and I using my birch bark call. Although we harvested only three (that is all we wanted) of those bulls it shows the effectiveness of the call. During another moose hunting trip both my partner and I were successful in calling bull moose using this method. Just last year I coaxed out 3 separate bull moose when other hunters saw nothing at all. How well do the Traditional Birch Bark calls work? During a recent season, I called a nice bull in to a close 18 feet! That's no typo... that is 18 feet! Oh and there was a second bull moose following that one! The following season I had daily conversations with moose. Eventually calling in two bulls to a respectable 35 to 40 yards. Last season... my hunting partner ended up only 10 feet from a bull. They were both VERY surprised! The birch bark calls really do make a difference. It is very exciting to have a bull moose answer your calls and then come to investigate you too! I can guarantee you will have the time of your life. We now have limited quantities of birch bark moose calls for sale. Hand made in Canada - made from Canadian Birch Birch Tree Bark and laced with either tree roots, braided cord or leather strips. They are approximately 31 cm (12") long with the large opening being approximately 13 cm (5") in diameter. Just use the Secure PayPal Buy It Now option to get one before they sell out. 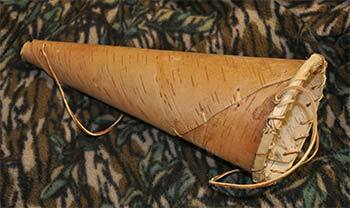 However; you may be interested in our Fiberglass Moose Calls which are modeled after the Birch Bark Calls. Be sure to get our book. It's full of valuable information! Note: Due to the nature of birch bark and various first nations peoples who make them, the calls may have slight variations from the ones in the photo. Leather lanyard not included. Don't like the thought of using a birch bark moose call? How about one made from fiberglass instead? We have launched our own line of fiberglass moose calls that sound even better than the birch bark ones and are way more durable. Check out our Fiberglass Moose Calls webpage. If you have access to a forest with good birch trees you could try and make your own. They look simple enough if you can get the bark. I modified one of our calls this year, using a standard leather hole punch to make holes and leather boot laces to sew it. 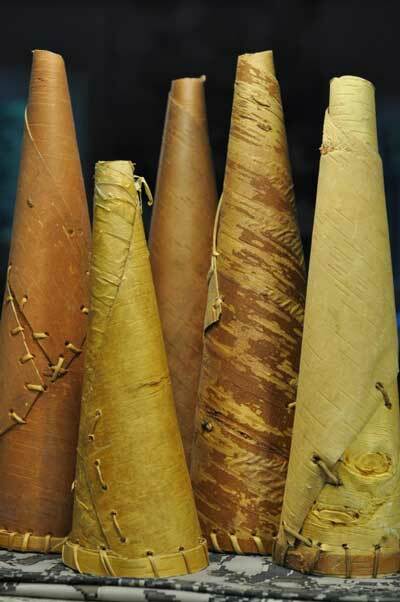 Birch bark calls are very basic in nature; a birch tree is stripped of a section of bark and then is rolled into a cone shape. The cones are the sewn together using softened strips of rawhide or bark. When dried the cones are very durable and with a little care will last a hunter a lifetime. If you really think about it. Calling moose should be one of the very first things you as a moose hunter should be trying. I encourage you to buy a birch bark moose horn now. When you and I hunt moose, more often than not we are just out looking. Looking for moose clues; droppings, rubs, bedding areas and tracks to name a few. Without visual clues it is easy to move on to another area. Remember... not so fast! Try some calling first, there just may be a moose within hearing distance. And of course... be patient! If you are not sure of what moose sound like, I have published a short video clip demonstrating the cow moose estrus whine. This is the sound a cow makes after she first makes contact or gets a response from a bull. I have published a video on How-to-Call-Moose using your voice and aided with a birch bark moose call. Otherwise you could get a CD or DVD to hear more of their sounds. As well, if you are intimidated by the thought of using your own voice to call moose then try one of the Reed or Diaphragm style calls. 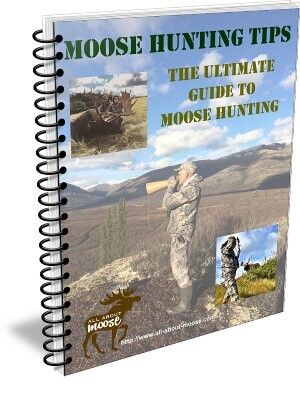 Get our moose hunting tips eBook - The Ultimate Guide to Moose Hunting! to go along with your birch bark moose call. The eBook consists of 57 chapters... 150 pages of information, jam packed with tips, photographs and discussions - Buy it now!